To enter the program configuration mode, execute the file "DNCprecise.exe". If the program is already running, open the window of the running program. Once the program is launched, the main program window is opened (fig.1). It is in this window that you create the list of active machines, select actions that should be done, view the log of either messages from the program itself or operations performed with a machine. 1. The toolbar with the buttons to perform actions, add, edit or remove machine descriptions and also to select the mode the machine should work in. 3. Setup – allows you to change the configuration of a previously added machine. To perform this action, you should select the necessary machine and press the button. A dialog window will appear where you can edit the needed parameters. After you press the "OK" button, the changes you have made will be saved. 4. Receive – allows you to receive a file from a machine in the manual mode. In this mode the name of the file to be saved is asked and after it is specified, the program switches to the mode for receiving files. 5. 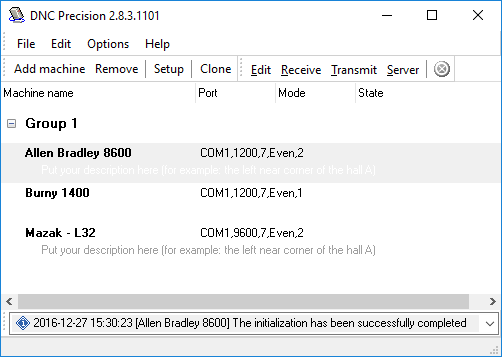 Transmit – allows you to send a file from the computer to the machine in the manual mode. In this mode the name of the file to be sent is asked and after it is specified, the program switches to the mode for sending files. 6. Server – switches the program to the server mode for the selected machine. In this mode files are sent and received automatically without any activity from the user. For the program to work correctly in this mode, you should correctly configure the parameters related to the server mode. 2. The list of machines available for operations. The user creates the list with the help of the buttons on the toolbar. Warning: it is possible for monitors with low resolution not to display the entire window. Note: It is the default that the access to the machine parameter settings is granted only after the password is entered. The default password is empty (you can change configuration without password).